The fox body mustang has become one of the most sought after Mustangs in recent years. In some ways it's more popular now, than it was when it was introduced. The fox platform is a unitized body, rear wheel drive chassis that was designed to be the basis for a number of Ford vehicles from 1978 to 1993. This platform included not only the Mustang, but the Mercury Zephyr, Ford LTD, Lincoln Continental and the Mercury Capri, which was no more than a thinly disguised Mustang. The fox body mustang and the fox platform name comes from its early development code name Fox. This car was designed to be bigger overall than its Mustang ll predecessor and allow more room for the available 5.0 liter V8 engine. A major restyling of both the exterior and interior was done and put Ford's more modern take on the classic vehicle. Engine output, however, was reduced from its predecessor, with the elimination of the 5.0 liter or 302 cubic inch engine, which was replaced for 1980 and 1981 with a smaller, more restricted 4.2 Liter V8 with only 120 horsepower. It's 2.3 Liter turbo four became the high output choice for the fox Mustang, with unfortunate reliability problems that caused its early cancellation. The year 1983 brought back the convertible in the fox body Mustang. It also brought back a special limited edition 20th anniversary GT350. These cars came equipped with either the turbocharged 2.3 liter producing 145 hp, or the burly 5.0 liter fuel injected engine, which was to become the Fox body enthusiast's engine of choice. More 1983 Mustang details and specs. More 1984 Mustang details and Specs. 1986 Mustang Details and Specs. Major revisions were made to the fox mustang platform, the body and the interior to make this Mustang sleeker looking and more potent. The power in the V8 was punched to 225 horsepower and Ford's changes to the electronic engine control module (EEC)and a change from a speed density system, which compared manifold pressure, vacuum and barometric pressure to the simpler and very accurate mass airflow system which calculated the airflow entering the engine as it passed over a heated wire. This new system in the fox Mustang, made it possible to tune and improve the engine horsepower, response and performance by aftermarket manufacturers. As a direct result the fox body car has become the drag racers choice with a wealth of inexpensive go fast performance parts. 1993 saw the introduction of the Ford Mustang SVT Cobra, produced by Ford's in house performance and tuner division, the Special Vehicle Team. More 1987 Mustang Details and Specs. More 1988 Mustang Details and Specs. More 1989 Mustang Details and Specs. More 1990 Mustang Details and Specs. More 1991 Mustang Details and Specs. More 1992 Mustang Details and Specs. More 1993 Mustang Details and Specs. High performance parts for these cars are being made by many major speed manufacturers. 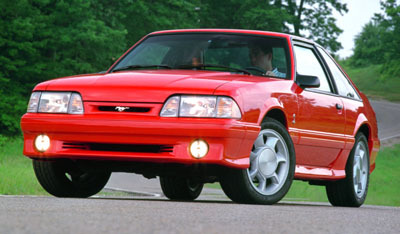 The following link looks at some of the best performance parts for the fox body Mustang .